Writing this on a cold, wet and windy Christmas eve it is hard to imagine the balmy sunshine we had in early July in this year’s summer. There were about three weeks of wall-to-wall sunshine, which not far off a miracle in Ireland. We are so used to getting miserable summers. We went on a family holiday with friends in July. We didn’t need to travel far to get to some of the most spectacular beaches and scenery in the world. West Cork is amazing. I know I am biased, in that I am a very proud Corkman, but I urge any of you who have not been to Cork to come and visit. You will not be disappointed. 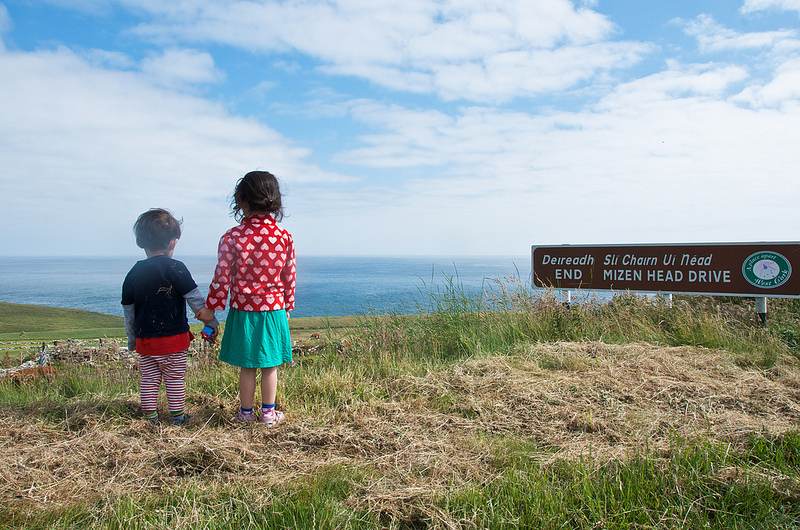 The shot I am choosing for July is one of my two kids holding hands staring out to the Atlantic ocean from the most southerly point in Ireland, Mizen Head. It is virtually impossible to get kids to pose for photographs, and while this one is not staged, I could not have wished them to pose for me in a better way. I love the sense of possibility about this image and the love the two share together. I would hope as they journey through life they continue to be there for each other and to believe that everything is possible; possible with love. I won’t be posting tomorrow – Christmas Day, so I will take this opportunity to wish you all a very Happy Christmas and to say a very big thanks for all the support and kindness this year. Have a great day tomorrow. This entry was posted in A Flickr Year, My own favourite photographs, photograph posts and tagged art, Atlantic, Brendan Ó Sé, children, End-of-year review, flickr, Happy Christmas, July, love, Mizen Head, words.